Happy Sunday everyone! 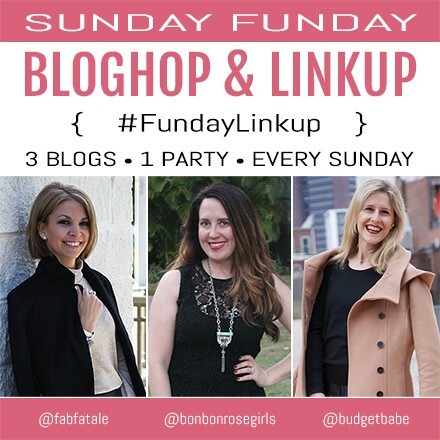 Welcome to the 3rd edition of a new series we're dubbing the "Sunday Funday Bloghop & Linkup." Join me and my fellow hostesses Jennifer of Fab Fatale and Kristin of Bon Bon Rose Girls every Sunday morning at 8 a.m. for fun giveaways, good friends and inspiration to "try something new today"! Bloggers, please share your "best of the week" post in the linkup below so that we can all see what you've been up to. Our fav linkup each week will be featured at Fab Fatale, Bon Bon Rose Girls, and The Budget Babe blogs in next week's Sunday Funday edition! Readers, please join in the fun by checking out all of the linkups below - the response to our first two linkups was absolutely incredible (here and here), so thank you for participating and making this such a huge success. We couldn't do it without you! To welcome you to our bloghop series and show our appreciation, we're giving away a $50 Amazon giftcard below! Bloggers, readers, and everyone in between are welcome to enter for a chance to win.